While the consideration of functional and technical criteria, as well as a sense of coherence are basic requirements for solving a design problem; it is the ability to induce an intended quality of aesthetic experience that is the hallmark of design expertise. Expert designers possess a highly developed sense of design, or what in this research is called aesthesis. Reflection on 25 years teaching design in the USA, Hungary, and China led to the observation that most successful design students, more than intellectual ability, drawing, model making or drive, all seemed to possess what may be called an intuitive sense of good design. It is not that they already know how to design, or that they are natural designers, it is that they have a more developed sense aesthesis. 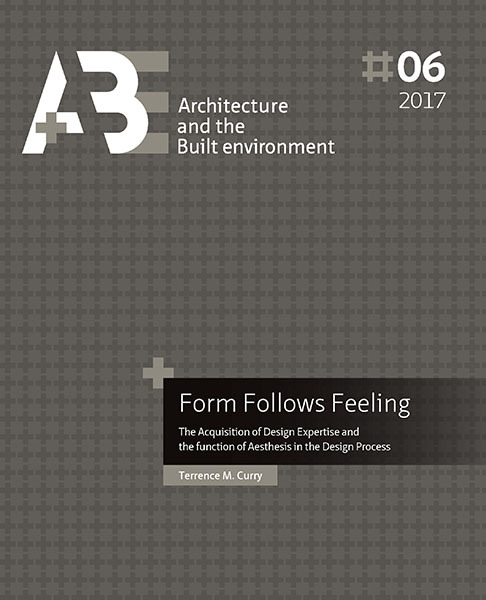 This research takes a multi-disciplinary approach to build a theory that describes what is involved in acquiring design expertise,identifies how aesthesis functions in the design process, and determines if what appears to be an intuitive sense of design is just natural talent or an acquired ability. The research started with topics related to design methodology, which led to questions related to cognitive psychology, especially theories of problem-solving. An in-depth review of research in embodied cognition challenged the disembodied concept of the mind and related presuppositions, and reintroduced the body as an essential aspect of human cognition. This lead to related topics including: pre-noetic (pre-verbal) knowledge, the cognitive architecture of the brain, sense mechanisms and perception, limitations and types of memory as well as the processing capacity of the brain, and especially how emotions/feelings function in human cognition, offering insight into how designing functions as a cognitive process. The research provides evidence that more than technical rationality, expert designers rely heavily on a highly developed embodied way of knowing (tacit knowledge) througout the design process that allows them to know more than they can say. Indeed, this is the hallmark of expert performers in many fields. However, this ability is not to be understood as natural talent, but as a result of an intense developmental process that includes years of deliberate practice necessary to restructure the brain and adapt the body in a manner that facilitates exceptional performance. For expert designers it is aesthesis (a kind of body knowledge), functioning as a meta-heuristic, that allows them to solve a complex problem situation in a manner that appears effortless. Aesthesis is an ability that everyone possesses, but that expert designers have highly developed and adapted to allow them to produce buildings and built environments that induce an intended quality of aesthetic experience in the user. It is a cognitive ability that functions to both (re)structure the design problem and evaluate the solution; and allows the designer to inhabit the design world feelingly while seeking aesthetic resonance that anticipates the quality of atmosphere another is likely to experience. This ability is critical to the acquisition of design expertise.